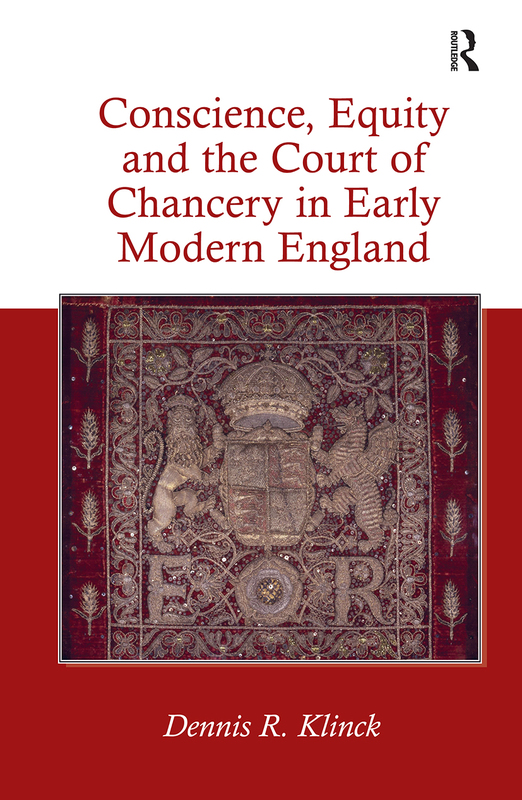 Judicial equity developed in England during the medieval period, providing an alternative access to justice for cases that the rigid structures of the common law could not accommodate. Where the common law was constrained by precedent and strict procedural and substantive rules, equity relied on principles of natural justice - or 'conscience' - to decide cases and right wrongs. Overseen by the Lord Chancellor, equity became one of the twin pillars of the English legal system with the Court of Chancery playing an ever greater role in the legal life of the nation. Yet, whilst the Chancery was commonly - and still sometimes is - referred to as a 'court of conscience', there is remarkably little consensus about what this actually means, or indeed whose conscience is under discussion. This study tackles the difficult subject of the place of conscience in the development of English equity during a crucial period of legal history. Addressing the notion of conscience as a juristic principle in the Court of Chancery during the sixteenth and seventeenth centuries, the book explores how the concept was understood and how it figured in legal judgment. Drawing upon both legal and broader cultural materials, it explains how that understanding differed from modern notions and how it might have been more consistent with criteria we commonly associate with objective legal judgement than the modern, more 'subjective', concept of conscience. The study culminates with an examination of the chancellorship of Lord Nottingham (1673-82), who, because of his efforts to transform equity from a jurisdiction associated with discretion into one based on rules, is conventionally regarded as the father of modern, 'systematic' equity. From a broader perspective, this study can be seen as a contribution to the enduring discussion of the relationship between 'formal' accounts of law, which see it as systems of rules, and less formal accounts, which try to make room for intuitive moral or prudential reasoning. Contents: Preface; Introduction; Conscience and the medieval chancery; The early 16th century and Christopher St. German; The later 16th century; Protestant conscience 1: the early 17th century; The conscience of early-17th century equity; Protestant conscience 2: the later 17th century; Later-17th century equity and Lord Nottingham; Conclusion; Bibliography; Index.